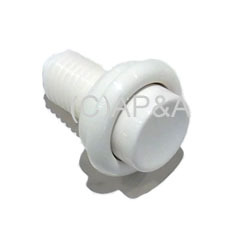 White plastic pushbutton with threaded housing. LONG button measuring 1-1/4-inches deep, 7/8-inch thread length. Commonly used for flippers on older pinball games, start button, fire button on video games, etc. Used on various makes/models. Also replaces Bally # A-711.